This month I had a little help with my Secret Recipe Club Submission. Perusing Rachel's, The Avid Appetitie, blog (she reminds me SO much of myself some 20 years ago), I had already picked out a few recipes to be narrowed down when a pre-teen voice from over my shoulder yelled, "That one!! You have to make that one!!" While I was actually reading Rachel's book review (she has wonderful reviews on all sort of topics! 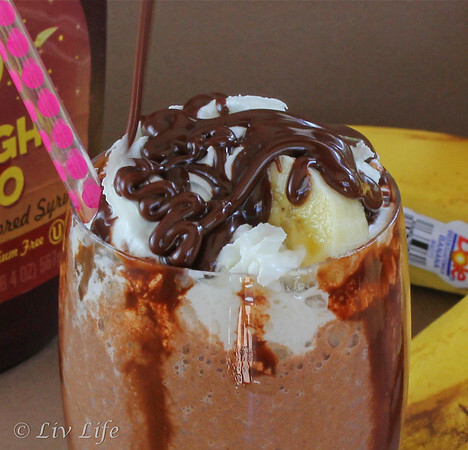 ), Liv's eye had spotted whipped cream, chocolate and banana in the form of a Triple Chocolate Banana Milkshake. As luck would have it, we were in the midst of spring break with no dance or school activities and within minutes our milkshake was in the works. Making a few substitutions to avoid a trip to the store (mostly to get the milkshake done sooner), Liv substituted chocolate coconut milk ice cream for the pudding and decided to leave out the cocoa powder while adding additional chocolate syrup. I've recently been informed that one really can not have too much chocolate syrup (Though Liv and I are aware that some of our friends will disagree on this point...). Blending the concoction took mere minutes and my Liv-in food stylist went to work while I set up the camera. Carefully styling the whipped cream and adding a decorative slice of banana, Liv proclaimed the shot ready as she lovingly poured even more chocolate syrup over the top for an action food shot. Having a stylist with an eye for detail make my job so much easier. 10 minutes into the shoot, the milkshake was somewhat melty and the whipped cream began to droop, but Liv dug in without hesitation and proclaimed Miss Rachel's treat a true winner. 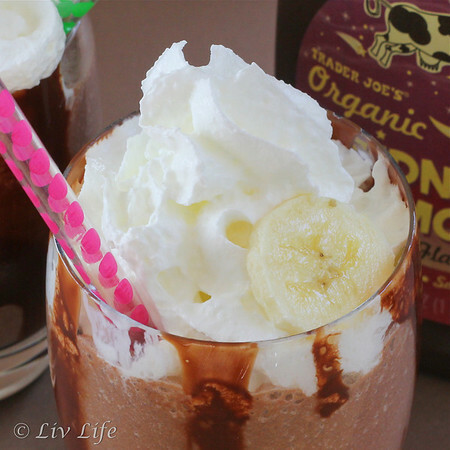 Place milk, bananas, ice cream, chocolate syrup and vanilla extract in a large glass measuring cup or in a blender. Blend (in blender or in measuring glass with an immersion blender) until smooth and creamy. Line two glasses with a bit of chocolate syrup and distribute milkshakes in said glasses. Top with a dollop of whipped cream and drizzle with a little more chocolate syrup. Add a banana slice for garnish. How delicious! Great SRC choice! oh I am thrilled that you made this and enjoyed it! It has become my favorite treat lately and I love that I can enjoy it totally guilt-free! You really made it so beautifully! The photo in the group is the action shot, knowing Liv's hand is holding that bottle of syrup. I love it. I'll bet Dudette would be all over this milkshake. Like you guys, she's all over the chocolate thing. Ummmmm because it's healthier...can I have four? Looks sinfully delicious! These look amazing! I can hardly wait to make them. Wonderful SRC choice. ummm...wow...that's about all i can say. my kids would have a field day over this. It's 88 degrees in Utah today--this does look refreshing! Perfect SRC pick. Yum-OH! I need a live-in food stylist...want to send Liv to San Antonio for a month this summer to help me out? This is perfection to me: chocolate and banana...and ice cream. Hell yeah! Very pretty! I love the pics. the milkshake looks like I should be able to grab it off the page, which I would do if I could! Sounds and looks delicious!!! Will your food stylist give consults? 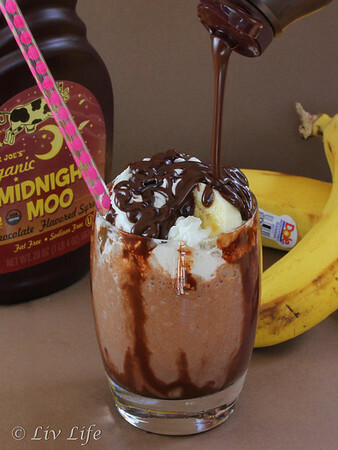 The milkshake looks completely decadent, especially with all that careful styling and drizzling of chocolate syrup! Your photos are so stunning it is hard to breathe - look at that chocolate syrup! This looks absolutely delicious! Love that you chose this awesome triple threat for SRC! So much chocolate! So much delicious on this page right now, my eyes can't take it! Wow..I am drooling over that, Kim! So worth trying! Thanks for sharing my friend and have a wonderful evening! Oh wow does this look good!!! Super yummy! 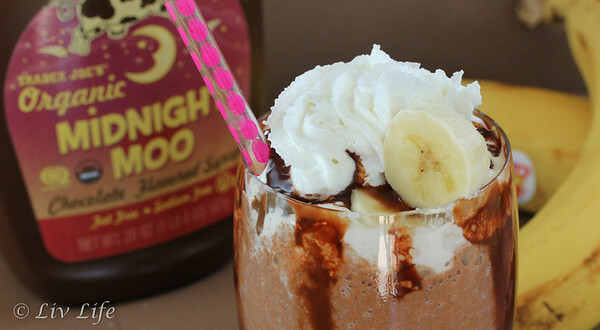 Everything about this milkshake is calling my name! I only know few people that don't care much for chocolate, but there's no such thing as too much chocolate! Im long out of my pre-teen years and I would have been standing over your shoulder asking for this one too! This looks amazing!